Hungarian journalist; born at Vagujhely, Hungary, Oct. 1, 1847. He received his education in his native town, at the gymnasia at Prague and Presburg, and at the University of Budapest (Ph.D. 1870). In the year of his graduation he joined the editorial staff of the "Pester Lloyd," on which he served until 1890. From 1877 till 1890 he was also teacher at the gymnasium of Budapest. In the latter year he removed to Paris and became director of the Baron de Hirsch philanthropic institutions. He is at present (1905) director of the Jewish Colonization Association and a member of the Central Committee of the Alliance Israélite Universelle. He was sent by the former association in 1896 and again in 1902 to the Argentine Republic and to Rumania. 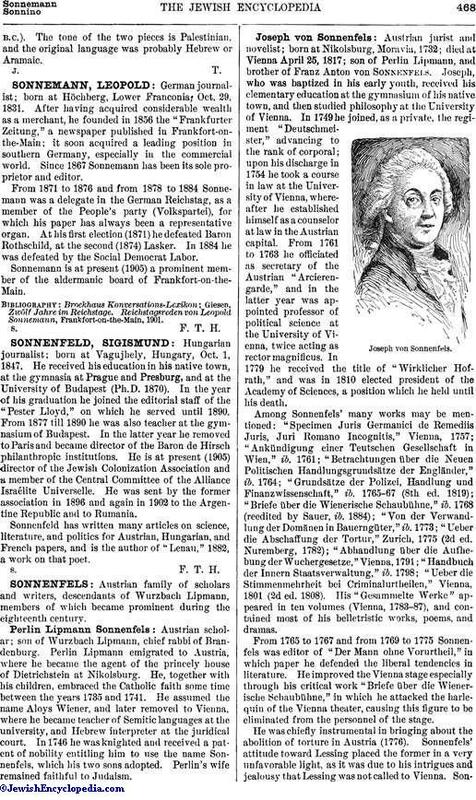 Sonnenfeld has written many articles on science, literature, and politics for Austrian, Hungarian, and French papers, and is the author of "Lenau," 1882, a work on that poet.